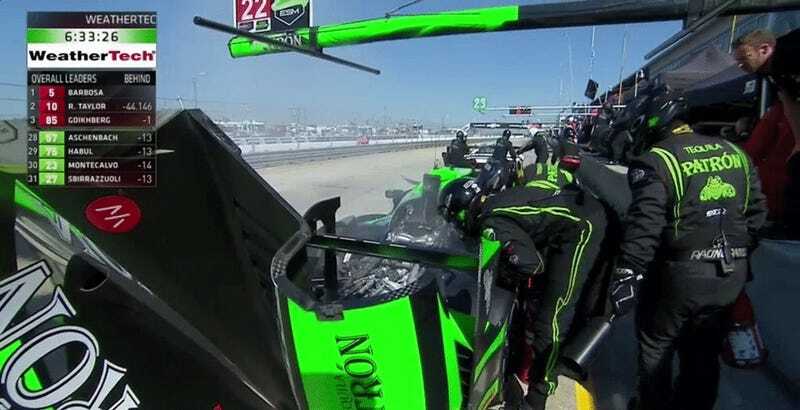 The Tequila Patrón Extreme Speed Motorsports team has had thoroughly lousy luck this year at the 12 Hours of Sebring, but it’s mostly been on the No. 2 car. It’s the No. 22's turn, though, as something in the engine bay had to be spritzed with a fire extinguisher when it came in to the pits. The No. 22 ducked behind the wall shortly after its car-b-que was extinguished for lengthier repairs. 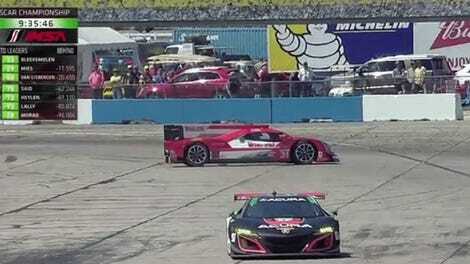 It had been running in fifth place overall before the stop. Meanwhile, the team’s No. 2 is back out on track but after an extended stay in the garages to fix an overboost issue that plagued them in qualifying as well as throughout the race. The No. 2 is the reigning 2016 winner of last year’s 12 Hours of Sebring. Both cars are brand-new Nissan DPis for the new 2017 Prototype class spec. Without a miracle in the next six hours or so, it looks like we’ll get a new winner no matter how much of a badass No. 2 driver Pipo Derani is. The team is diligently trying to get the cars back out there as much as possible to shake down further problems, so hopefully they’ll be better later in the year.